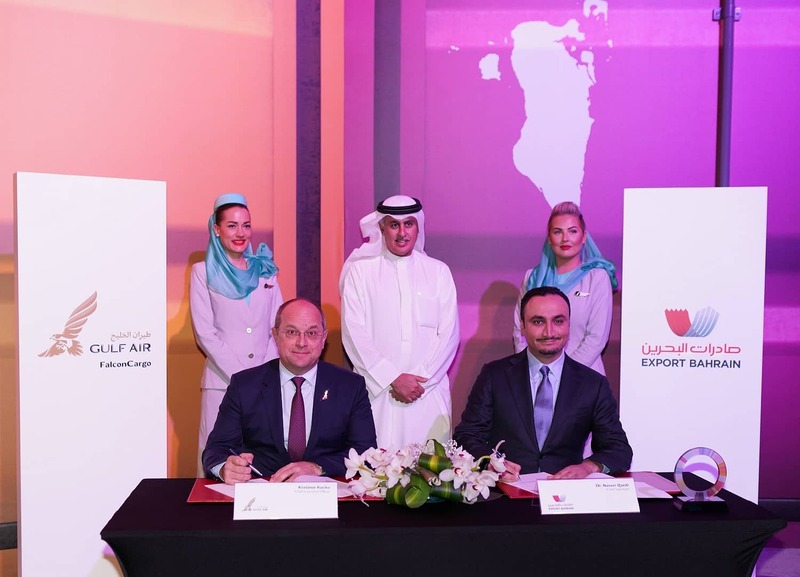 Export Bahrain signed an exclusive partnership with Gulf Air’s Falcon Cargo to provide SMEs in the Kingdom of Bahrain, exporting their goods to the tune of 100 kilograms or above, with special discount of up to 40% on their cargo exports. The partnership agreement was signed during the Global Entrepreneurship Congress (GEC) Bahrain 2019, which is being hosted in the Kingdom from the period 15-18 April 2019. Attended the signing ceremony H.E. Zayed bin Rashid Al Zayani the Minister of Industry, Commerce and Tourism and Chairman of Gulf Air, while the agreement was signed by Export Bahrain Chief Executive Dr. Nasser Qaedi and Gulf Air’s Chief Executive Officer, Mr. Krešimir Kučko. Export Bahrain’s Chief Executive, Dr. Nasser Qaedi praised the opportunity of announcing this partnership that coincided with the 2019 GEC. He stressed the importance of this event which bringing together thousands of entrepreneurs, investors, researchers and economic policymakers from more than 170 countries. Gulf Air’s Chief Executive Officer, Mr. Krešimir Kučko said: “Our most important strategy pillar is to contribute to the economy of the Kingdom of Bahrain and today, as we signed the partnership with Export Bahrain, we are facilitating export services for SMEs in Bahrain at preferential rates. We want to support the small and medium-sized enterprises to export their goods to the outer world and show pride in the Kingdom’s manufactured products. This is the start of a good potential for Gulf Air, Export Bahrain and SMEs in Bahrain”. SMEs can have their application registered and processed through Export Bahrain office located in Bait Al Tijjar building, to avail the discount and process their exports.